Out of brunch ideas? Have we got a solution for you! A hash is the perfect way to use up seasonal veggies and transform them into an entirely new dish. Top with an egg or two and you've got a no-fuss, complete meal. 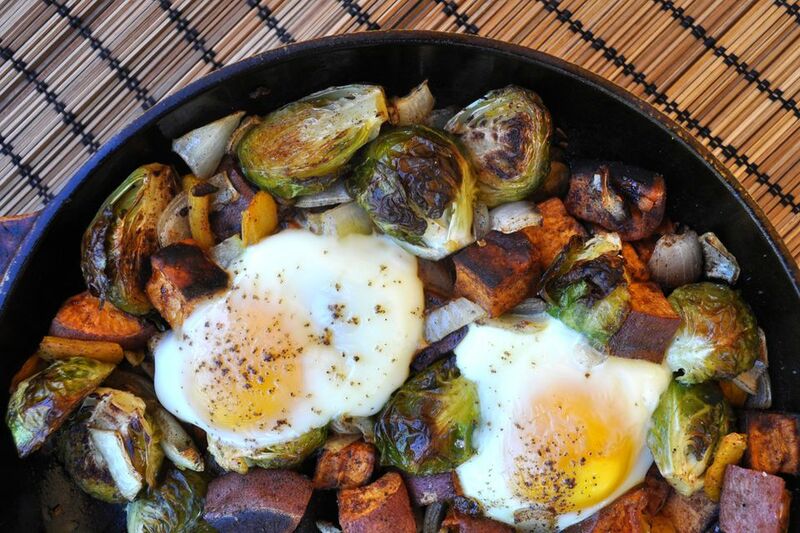 Instead of the traditional potatoes and meat, this hash keeps things healthy with roasted Brussels sprouts, sweet potato, bell pepper, onion and garlic. Paprika and cayenne add a little spice for some additional flavor, and the eggs cook perfectly right on top! This recipe serves two as a main course, and four as a side dish, and can be easily doubled for a crowd (just use a bigger pan at the end). The hash can even be made ahead of time. Just store it in the fridge and reheat it in the oven at 400 F for 10 minutes before adding the eggs and proceeding with the recipe as written. For a real brunch feast, serve with homemade cinnamon rolls and crisp bacon. It's also a great option for when you are craving breakfast for dinner. "Brinner" anyone? Add the sweet potatoes to a large baking sheet. Toss them with 1 tablespoon of oil and season with salt and pepper. Spread into a single layer. Roast for 20 minutes. Toss the Brussels sprouts, onion and bell pepper in the remaining 1 tablespoon of oil and the paprika, cumin and cayenne pepper. Season with salt and pepper and add to the sweet potatoes. Toss together and spread out into a single layer. Roast for 15 more minutes, or until the potatoes are tender and and the sprouts are browned. Reduce the oven temperature to 400 F.
Add the garlic and add the veggies to a medium, oiled cast iron skillet or baking dish in an even layer. Crack each egg on top of the veggies evenly spaced apart and not touching the sides of the pan. Season with salt and pepper. Bake for about 15 minutes, or until the whites are set but the yolks are runny. Test the egg whites by poking them with a knife.